I'm looking for a ceiling mounting plate for a 52" Hunging III ceiling fan (Model No. EF200DA-52). I've seen it posted where the Westinghouse canopy bracket, SKU 231673 will serve as a replacement. However, this bracket will not work in a "close to ceiling" install as it is not long enough. I need to find the OEM mounting plate. Any help is appreciated. I'm assuming you meant to describe your fan as a Hampton Bay Huntington III model. If this indeed your model and brand of fan, you'll need to contact Hampton Bay directly to get the correct replacement part in the phone number shown below. 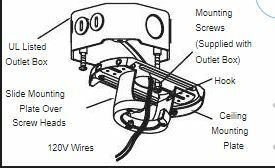 The Westinghouse canopy bracket/mounting plate we sell at our local Home Depot stores do not have the function as you requested, so contacting the manufacturer (Hampton Bay) would be your best bet.